Consultants – Every client has different reasons for buying their yacht and therefore different needs. It is our aim to help satisfy the owner that every sensible precaution and course of action is being taken by all parties involved. Crew finders – We don’t select crews from CVs that are blindly sent to us but have seen them aboard other owners boats, how they operate and maintain them all the way through to how well they dock the yacht, and then how they relax on them. Factory visits – Having overseen the production, launch, commissioning and refit of many catamarans, we understand the need for the yard to be in tune with the owners needs. 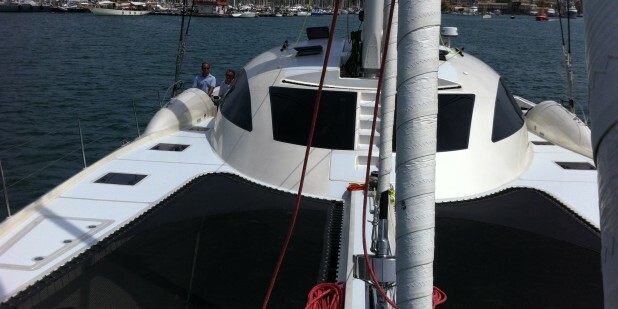 Shakedown Cruise – We will put all the plant, systems and rigging through a thorough test, including dockside, under motor, at sail and at night. Delivery – We only use skippers who have catamaran sea miles, not just the right tickets out of a box. We feel we offer a different product from most delivery companies through the depth of experience in catamarans and also in our approach to the logistics of the task. Introduction to Brokers – For those wanting see some return on their investment, chartering the yacht can make a lot of sense. It is normal for a charter yacht to take 3 seasons to reach capacity for charter. We can help fast track that process. Marketing – Content will determine whether or not a broker will hand out a brochure to clients. Websites are a great way to attract direct business, and also provide the electronic information that a charter broker needs. The best brochures and web sites require the best photos in the best locations and nothing sells a yacht better or is easier to get to a client than video. Pre Delivery Inspection – We work with builders testing quality control, ticking off items to agree they have all performed as prescribed. We will put all the plant, systems and rigging through a number of performance cycles. This will need to be carried out dockside, under motor, at sail and at night. We usually carry out the inspection independently however if you wish to be present we are happy to share our knowledge during this time. We offer a free consultation for services offered by Synergy yachting. We aim to provide a fair and effective service and prefer to meet with you to discuss how we can help, before you commit to us. We will listen to your needs and questions and offer an opinion on which of our services may be of use and an estimate of expense. Free initial consultation (UK only). Expenses only for travel to either the EU or the USA.